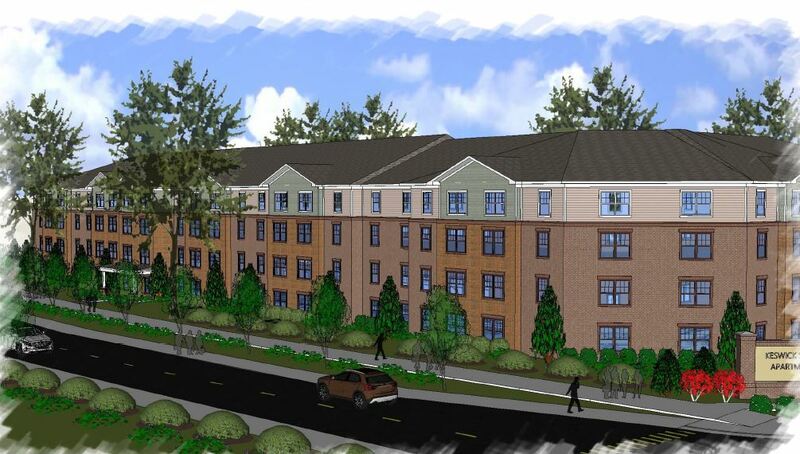 Fredericksburg, VA– Humanities Foundation has begun construction on a 116 – unit apartment complex valued at more than $22 Million. Yet another major milestone for Humanities Foundation, Keswick Apartments II will be the Foundation’s fifth development in the Fredericksburg, Virginia MSA and is the third phase of a contiguous development totaling 336 units. Once Keswick II is completed, Humanities Foundation will own more than 1,000 units in VA.
Keswick Apartments II will be an attractive three-story complex comprised of garden apartments for families, some of which will be elevator served. Construction has already begun on both the first phase, Keswick Senior Apartments, and Keswick Apartments I, the second phase. Once completed, all three phases will be Earthcraft Platinum Certified and have a value exceeding $60 Million. “We are thrilled to reach the 1,000 – unit milestone in Virginia,” said Tracy Doran, President of Humanities Foundation. All three phases are being developed within the master residential development of Keswick, which will consist of townhomes, single family homes, restricted villas, and an assisted living facility. Residents of the community will be able to enjoy sporting amenities, open spaces and walking trails and access to public transportation. Unit amenities will include a refrigerator, range/oven, garbage disposal, dishwasher, microwave, washer/dryer hookups, carpet, tile, blinds, ceiling fans, walk- in closet and coat closet. Common area amenities will include a clubhouse, fitness center, picnic area, playground, business center, food pantry, computer room, laundry facility and video surveillance. Joe Krengel of Merchants Bank and RICHMAC Funding stated, “We are extremely pleased to partner with Humanities on such a great affordable housing project, Keswick Apartments II. It was a privilege to provide the construction financing through Merchants Bank and the permanent Freddie Mac forward take-out loan. They are concerned with providing high quality affordable units to residents with numerous amenities often found in higher end market rate projects. Humanities is a best-in-class developer and working with them has been such a rewarding experience.” Keswick Apartments II is a joint venture with James Doran Company. CAHEC is the syndicator. “CAHEC is thrilled to have an expanding and diversified relationship with Humanities Foundation. Our equity and debt products have allowed for outstanding developments, such as Keswick Apartments II, to join CAHEC’s family of funds. We could not be more proud of Tracy and her entire development team,” said Dana Boole, President & CEO of CAHEC. Architectural services were provided by Martin Riley Associates and civil engineering services were provided by Webb and Associates. Coldwell Banker Elite/Coldwell Banker Commercial provided land brokerage services. KBS is the contractor and construction will take approximately 14 months.